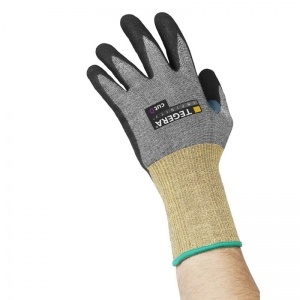 The Ejendals Tegera Infinity 8811 Level D Cut Resistant Work Gloves utilise a combination of the most advanced cut-resistant and oil-resistant technologies to keep your hands safe in the harshest industrial environments. 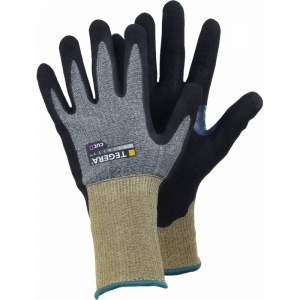 These gloves offer a soft, highly functional grip and have an extended cuff to ensure wrist protection. The Ejendals Tegera Infinity 8811 feature palms that are dipped in a mixture of nitrile foam and water-based PU (polyurethane), and finished with a foam grip pattern. 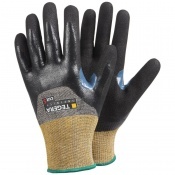 This makes the glove highly oil and grease resistant, which is ideal for handling tasks involving oily components or machinery. At the same time, the back and cuff areas of the glove remain uncoated for better ventilation and user comfort. The Ejendals Tegera Infinity 8811 are available in six different sizes. Please consult the table below for details and select the appropriate size for you from the drop-down menu above. The Ejendals Tegera Infinity 8811 are suitable for machine washing at 40°C.